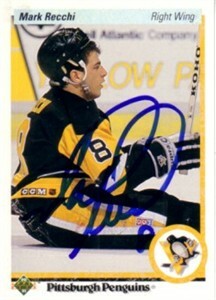 1990-91 Upper Deck Rookie Card autographed in blue marker by former Pittsburgh Penguins star Mark Recchi, who won the Stanley Cup with three different teams. With certificate of authenticity from AutographsForSale.com. ONLY TWO AVAILABLE FOR SALE.